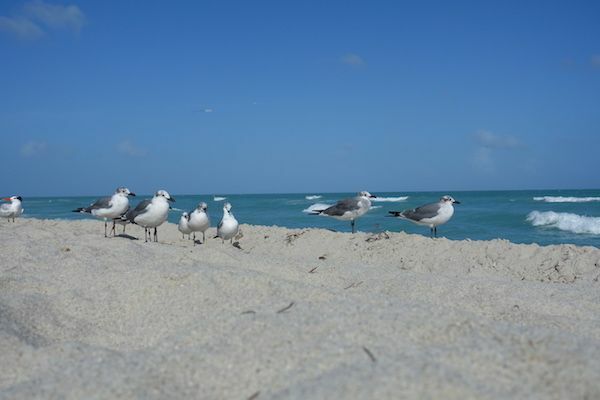 Miami Beach travel tips…how to enjoy it to the utmost! 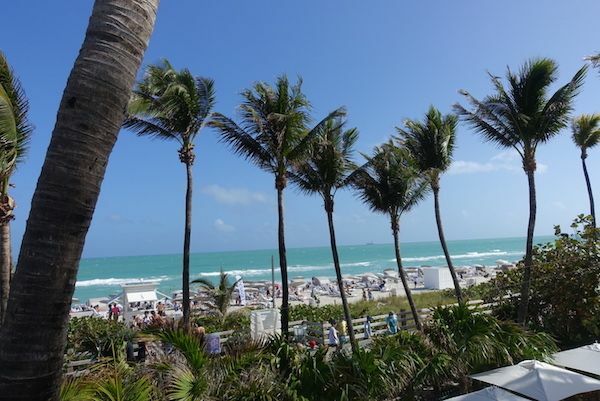 The white sandy beaches, the swimming friendly sea, and the warm weather throughout the year, are just a portion of what Miami Beach has to offer. It has beautiful beaches, varied international gastronomy, superb ocean views, high-end shopping, extensive and varied hospitality offer, wonderful spas, art deco, cool party scene, and sunny skies. 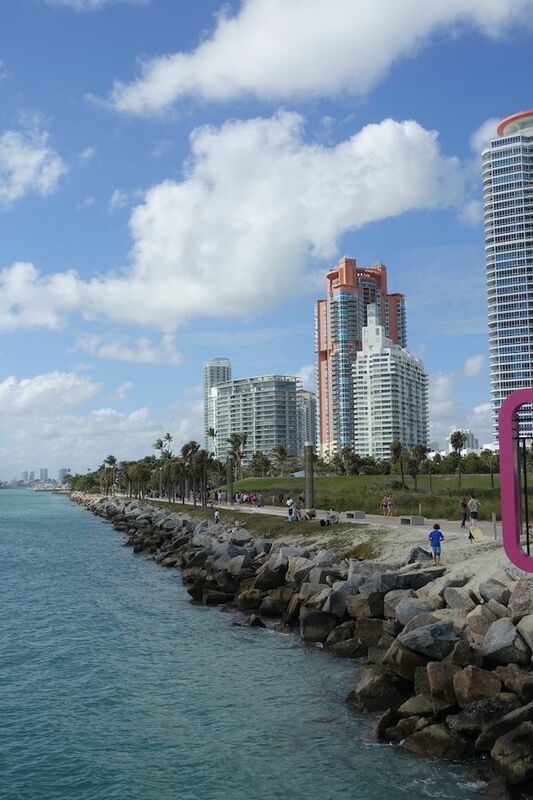 Start where McArthur Causeway arrives to Miami Beach, on 5th St., and walk along the water towards the south. 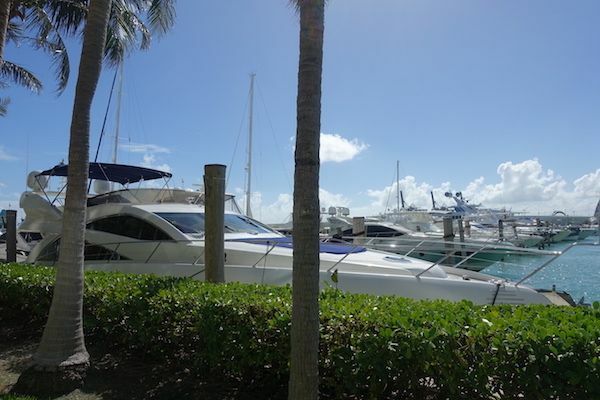 It’s a peaceful stroll with beautiful boats of all sizes, the Miami Beach Marina and water taxis. There are a couple of restaurants and a mini market in the area. Continue walking along the water all the way to the South Pointe Park Pier. It’s the perfect place to stop, relax, feel the ocean breeze and take pictures. You can see the private Fisher Island from a distance, with its gorgeous apartment buildings and empty private beaches. I love to stop at Smith & Wollensky’s outdoor bar and restaurant because of the beautiful views, good vibe and fantastic food and drinks. This is a great spot to people-watch and boat-watch. If you are lucky, you might see a cruise pass by. 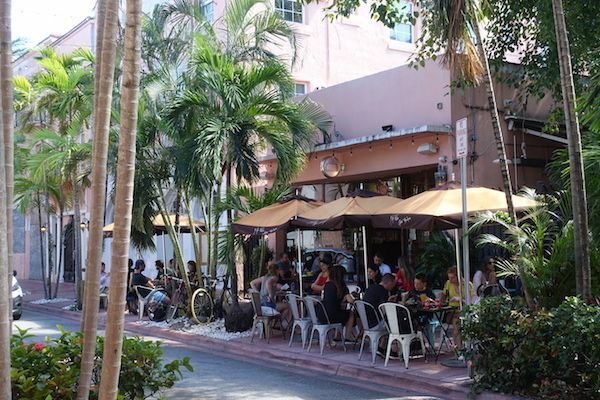 Ocean Drive and Collins Ave. are the most popular streets in South Beach. 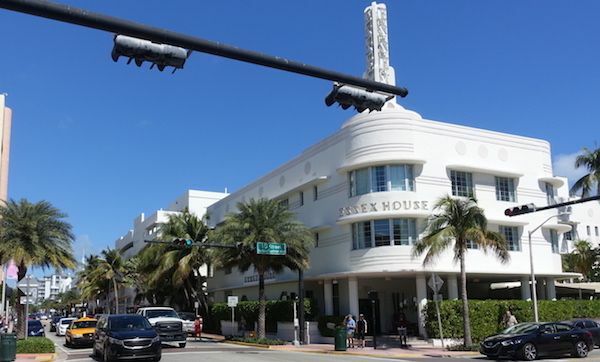 The art deco buildings have been featured in TV series and movies. Walk from 5th St. up to 21st St. and admire the beautiful style from the 1920’s and 1930’s. Española Way, Meridian Ave., Michigan Ave., Euclid Ave. have beautiful architecture as well, worth and will be less crowded and more relaxed. 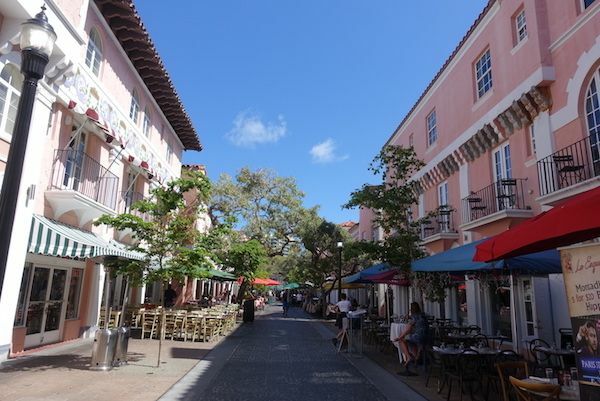 Lincoln Road is a pedestrian street with shops, restaurants and cafes. Located between Washington Ave. and Alton Road on 16th St. and 17th St. It’s always crowded and lively. There are many places to stop for food and drinks, and people-watch. On Sundays, there is a farmer’s market with fresh produce, food stands, and handcrafts for sale. If you go early in the morning, it’s the perfect place to have a nice stroll and a quiet breakfast in one of the many cafes. A lot of people walk their dogs in this area which adds to the experience. You can walk along the beach on a paved or boardwalk from 5th St. up to 46th St. My favourite part goes from 17th St. to 46th St. This section is less crowded and the stroll is beautiful with the beach on one side and beautiful hotels on the other side. I hear that the best pool party in Miami Beach is at Hyde Beach, in the SLS hotel. Fridays are more chilled out, on Saturdays and Sundays it gets crowded and wild. Another lively place for a drink and food is La Côte, the bar/restaurant at the Fontainebleau hotel. Some days they have live music and some dancing. Bal Harbour Shops is a beautiful semi-open shopping centre with luxury boutiques and an array of restaurants and cafes; from fine dining to a more casual style. I haven’t tried them all, but when I go, I’m always drawn to the Japanese restaurant, Makoto. The bar in the shopping area is a beautiful place to start with aperitif, surrounded by beautiful shop windows, flowers and palm trees. Le Zoo, French cuisine and Carpaccio, Italian cuisine are always in high demand. A more adventurous activity and a good workout is a bicycle ride along the beach on a sandy path. I go prepared, wearing a bathing suit underneath my clothes, ready to make beach stops and go for a swim. Don’t forget to bring water. Start on 73rd St. and go north through the paved path. You will see a park, go in and continue straight until you find the exit to the beach. 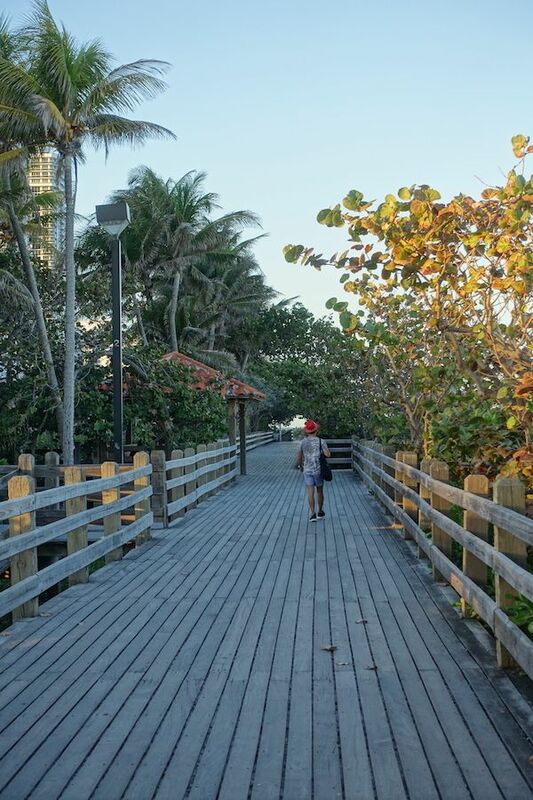 Ride north on the sandy path until the end, at around 110th St. As you go north, the residences, beaches and scenery get prettier and more luxurious. Perfect to enjoy the ride, exercise, stop for a swim, and take beautiful photos. SLS Hotel has two swimming pools, one for hotel guests only and one in Hyde Beach, open to walk-ins. From Friday to Sunday, they host pool parties with DJ’s and a minimum consumption which can be quite steep however, during the week there is no minimum consumption. It’s never crowded, the service is good, you get lounge chairs, towels, food and drink menu. I love to spend a whole afternoon there. At night it becomes a chic bar/club, beautifully decorated with orange lighting and trees. Fontainebleau Hotel is a big and beautiful resort with an array of restaurants, bars, shops, swimming pools, amazing spa, one of the best clubs in town – Liv, and beach cabanas. Sometimes, I like to spend a whole day in this great resort and the way to gain access to all the facilities is to book a treatment at the Lapis spa. No matter at what time you book your treatment, they will give you full access from 9am-6pm. Lockers, towels, beach lounge chairs included. I love this place! The Lululemon shop on Lincoln Road sometimes hosts free one hour yoga classes on Sunday mornings. Ask to see if there is a class while you are there. 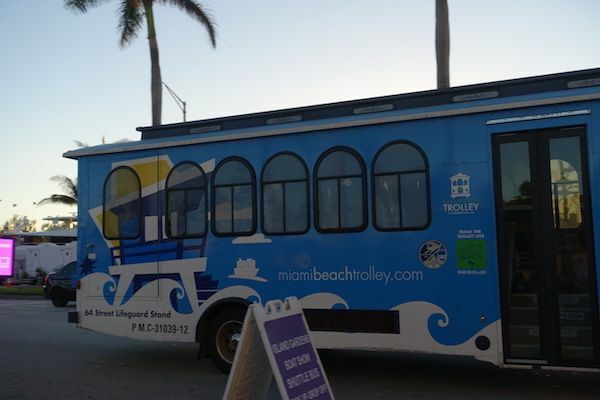 If you want to move around and are not in a hurry, I recommend taking the Miami Beach Trolley. It’s free of charge, clean and nice inside. There are four routes, some of which have Wi-Fi. It’s a good way to enjoy the local friendly culture because many locals use it as a mean of transport. Osteria del Teatro – is an Italian restaurant with a sophisticated decor, great cocktails and wine menu, and exquisite cuisine. They only use fresh produce of the best quality. 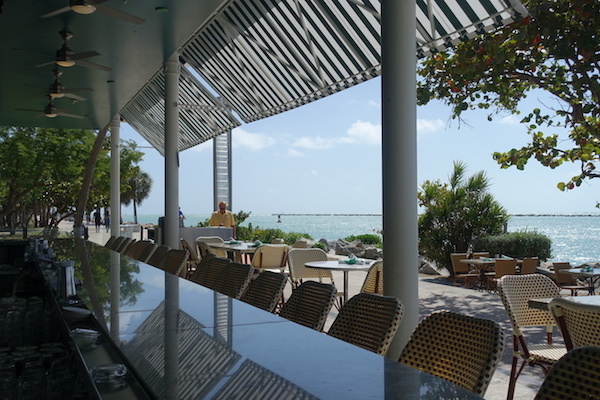 Juvia – located on Lincoln Road on a rooftop, has signature cocktails, amazing food with international influence, and a chic ambiance. During the day the views are beautiful with the sea at a distance. At night the lighting and decor change the atmosphere and add sophistication. Yardbird Southern Table & Bar – is an authentic restaurant with food from the Southern States, rich, farm fresh, tasteful. The bar area is a great option for aperitif. The signature cocktails on the menu can be strong, so be careful! Big Pink – is the perfect place to go hungry and craving comfort food. It’s a diner with big portions and great food. The terrace is nice and relaxing; good to people-watch. Bodega – is a very casual and colourful Mexican taco place with flavourful tacos, great salads and delicious hot sauces. At night, the beautiful bar inside opens and the fiesta begins. The Broken Shaker – is a laid back, tropical, art deco bar with amazing cocktails and a cool vibe. You can enjoy your drinks by the pool. Sazon Cuban Cuisine – is a recommendation for those looking for an authentic Cuban experience. The serving sizes are generous and the food is juicy and full of flavour. A classic is the Bistec de Palomilla with fried sweet plantains and black beans. Bâoli – is a chic bar and restaurant that turns into a club. Wednesday is the most popular night to go. The vibe in the outdoor bar is my favourite. 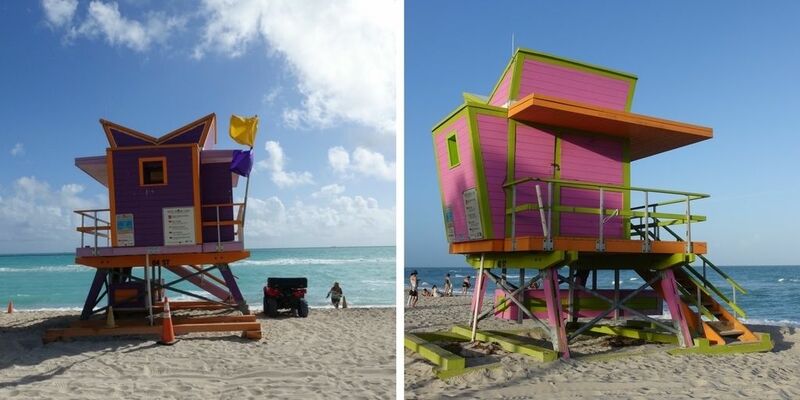 If you go to Miami Beach, I wish you a wonderful trip, lots of sun, and great memories upon your return! You might be interested to read about Miami. Three healthy smoothie recipes that will leave you energised! Great post. The last picture is so cute. Thanks for sharing the helpful information. As I am making a plan to visit it once. After reading this article my vision is more clear for the trip.